On the Camera side of this system, you will not be disappointed. If you are looking for a camera that can see past all other cameras, look no further! This professional camera features a 5-50mm manually adjustable lens allowing for facial recognition up to 100ft away! This is IMPOSSIBLE with standard cameras within the 2.8-22mm range. These are the best of the best with a resolution of 700TVL! You will not find a camera with a higher resolution. The DVR and Cameras complement each other in the astounding resolutions they are capable of. These are very high quality cameras made of metal with a Sony Effio-E image sensors. They will withstand the harshness of weather no problem. These are very versatile and work well in an indoor or outdoor environment. 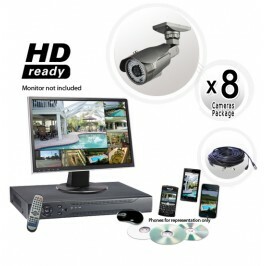 Long Range Night Vision 8 Camera System 700TVL 5-50mm Lens 0 out of 1 5 based on ratings. user reviews.